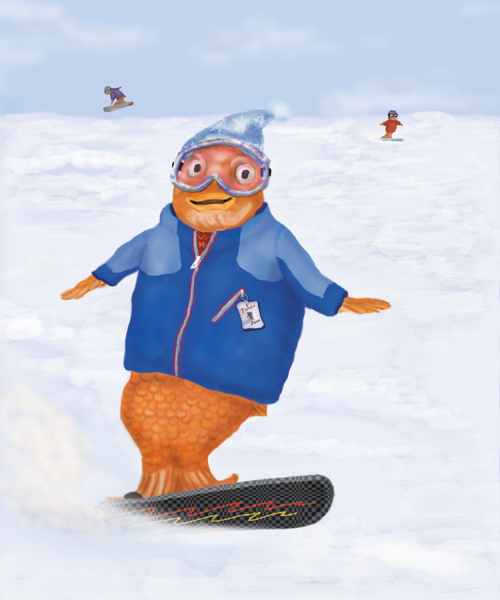 A mutant giant goldfish is seen enjoying his favorite winter sport, snowboarding at a ski resort at Lake Tahoe in California. Just recently it was reported that biologists from the University of Nevada at Reno have been routinely observing unusually large goldfish in the pristine waters of Lake Tahoe in Northern California. This phenomenon has caught the attention of the California State Fish and Game Department who have instituted routine patrols to seek out what they consider to be a dangerous invasive species. The scientists speculate that the giant goldfish were introduced in the Lake Tahoe by so-called “aquarium dumpers,” well-meaning people who when they were no longer able to care for their pet fish, decided to abandon them in Lake Tahoe where they believed they would live out their lives in a safe and pleasant environment in the company of many other species of fish and crustaceans. Some experts questioned whether a goldfish could survive the frigid winters that characterize this deep, high-mountain lake. However, reality proved to be stranger than fiction when the goldfish not only survived, but thrived in the harsh Alpine climate. Thanks to the nutrient-rich effluent making its way into Lake Tahoe, the goldfish not only thrived but were also genetically transformed as a consequence of the metabolites of psychotropic pharmaceuticals that were present in the sewage emanating from affluent neighborhoods along the lakeshore. They adapted splendidly and in no time at all they quickly blended into the local culture and adopted the habits and customs of the local residents. Now the goldfish are regularly seen enjoying the recreational facilities throughout the area, although they curiously prefer to avoid being seen at restaurants and tackle shops. 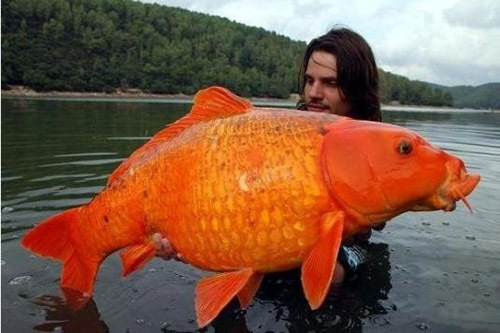 This is not by any means the first time giant goldfish have been seen in freshwater lakes. This trophy giant goldfish was caught by Raphaël Biagini, a legendary French “Carpiste,” who reeled in the monster “poisson rouge” from the waters of Lac de St. Cassien, a man-made reservoir in southern France. This is the same lake where a 75-pound world record carp was caught some 25 years ago. It is not clear how a tiny fish that normally graces home aquariums grew to such gargantuan size. Some locals familiar with the story attribute the fish’s extraordinary size with an incident that occurred a few years back when a barge laden with Camembert cheese capsized during a squall and sank with its cargo into the depths of Lake St. Cassien. The nutrient-rich cheese provided a source of food for several stray goldfish that, like Nemo, had been flushed down the toilet and somehow survived their transit through the sewage treatment plant. 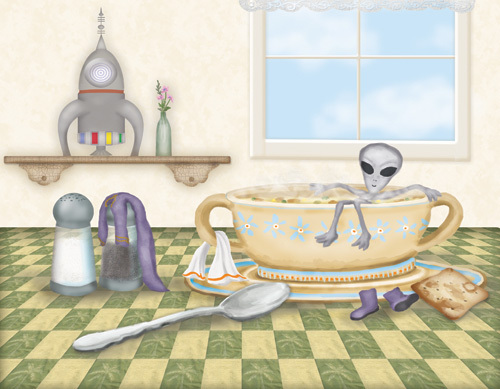 The discarded goldfish soon happened upon the sunken cache of cheese and began to feed on it. It appears that the Camembert rind that they devoured is coated with Penicillium candidum mold, which had the effect of strengthening their natural immunity and allowed them to grow to a colossal size that rendered them invulnerable to natural predators (except M. Biagini).